In early January 2018, two Coffs Harbour Rotarian's, Elaine Walsh and Wayne Stokes, along with friends Margaret Beckett and Lauren Walsh travelled to Sasebo in Japan. Our club recently received an unusual request to help erect a garden shed for a wheel chair bound local resident. How hard could that be you ask ? It only took minutes to erect in the video. The weekend of the the 3rd and 4th of March saw athletes of all ages decend on the Coffs Harcour Foreshores. On Wednesday 13th of September 2017 the members of the Rotary Club of Coffs Harbour honoured two of their longest serving members, Ken Hall with 40 years service to our community and Ossie Benson with 48 years service. 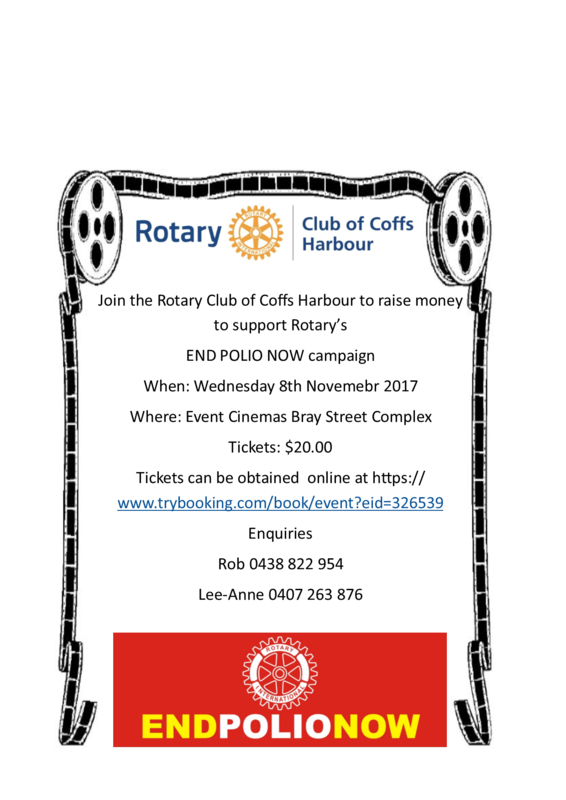 Join us at our Polio Fund raising Night. We will be taking on the movie Murder on the Orient Express on the night before it is released. Tickets are $20 for the movie. Have a look at our flier for details. This week we will be conducting our AGM, adopting our financial reports. We will have a look at this website as well. Finally we will Have an assembly. Tonight our club undertook another Vocational Visit, this time to Ozberries packing plant. What in the world does Rotary do.... read the stories of Rotary Clubs and Rotarians as they live Rotary's mission of "Service above Self" you'll be amazed and the interesting thing is that they are people like you and me!